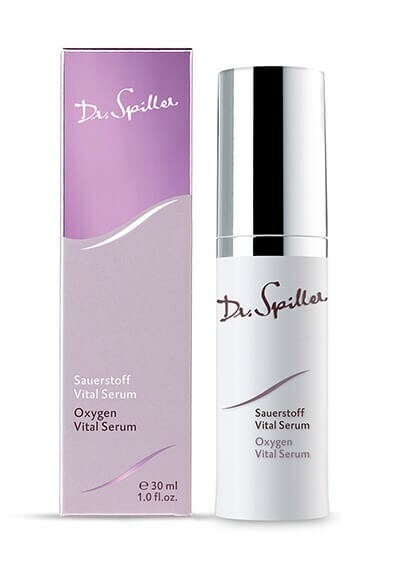 Oxygen Vital Serum enhances the supply of oxygen and the activity of skin cells. It counteracts irritation and smoothes the skin. Oxygen Vital Serum with its highly-concentrated oxygen carrier is an effective anti-aging product that activates fatigued skin cells and instantly improves their performance. Wheat Proteins add to the smoothing effect, and the combination of active ingredients with Glycoproteins instantly relieves stress in irritated skin. For a soft, smooth and harmonious complexion. Apply Oxygen Vital Serum to face, neck and décolleté morning and evening after cleansing. Follow with Q10 Oxygen Complex or Q10 Oxygen Complex Light.